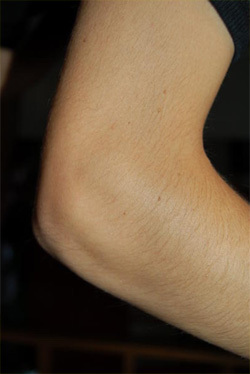 Most injuries of the elbow will cause some degree of stiffness, which can affect one’s ability to brush their hair or drink from a cup. This requires patience, until the fracture has healed and then, rehabilitative work. One must consider that one may not regain the amount of movement that they had in the elbow before injuring it. Sometimes a splint can be made that will slowly help straighten out or bend the arm slowly over time. Place the hand outstretched against a wall and run the fingers upwards along the wall. Stretching the wrist and shoulder muscles can take the pressure off the elbow so stretch these also. Using a chair with arm rests to push off, holding in the air while counting to 10, then slowly relaxing back into the chair.